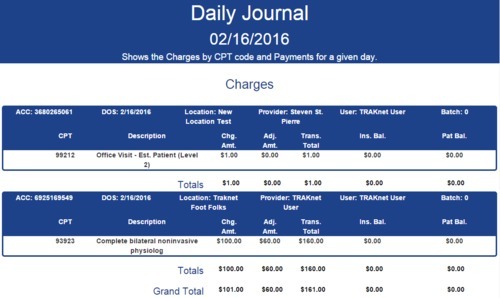 The Daily Journal report is an Advanced Report that displays the charges by CPT code and the Payments for a given day. The Daily Journal report is a report designed to track the intake of payments on any given day. The report is run for a single day at a time and is broken down into two sections: Charges and Payments. Acc — Patient account number. DOS — The encounter date. Location — The rendering location for the charge. Provider — The rendering provider for the charge. User — The user who entered the charge. CPT — The CPT code. Charge Amt. — The amount charged on that CPT code. Adj. Amt. — The amount of adjustments applied to that charge. Trans. Total — The amount billed for that CPT code. Ins. Bal — The amount remaining on that CPT code that is insurance responsible. Pat Bal. — The amount remaining on that CPT code that is patient responsible. The Payments listed on the Daily Journal report includes any charges where a payment was applied that day, regardless of the Date Created on the charge. Whereas Charges shows only CPT codes entered on the day of the report, Payments shows all CPT codes where a payment was entered on that date. The columns and information displayed in the Payments section mirror the columns listed above in the Charges section. Run Date - The date the report is generated. This will default to today's date and will show a daily journal for whichever day is selected.